Hi! I’m Kristin Swift. I’m the Mom of awesome twins, wife of a very understanding husband, aerospace engineer for the Navy, and a VT Hokie. I’ve been doing triathlons since 2009 and have completed almost 50 races with distances ranging from sprint to half Ironman. About 90% of those events have been with VTSMTS, now Kinetic Multisports. We love them because they put on such a friendly, professional event! My whole life, I’ve been a runner and as an adult, I learned to cycle, but I’ve always been scared of the water. 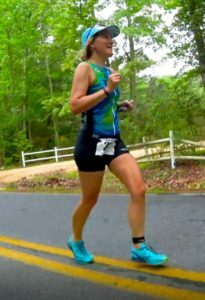 I really felt drawn to the sport of triathlon, though, so I worked to overcome my fears of open water and discovered I loved Triathlon and even the swim part (sometimes)! Our family struggles everyday to balance full-time jobs, two kids in school and three different year around sports, and training for triathlon. It’s not easy, but our love of this community is keeping us going. I love to get people excited about the sport of triathlon. Come out and join us; I bet you’ll fall in love with triathlon too.